Salaban (Sandur Madura) Artistry in all (18) districts. 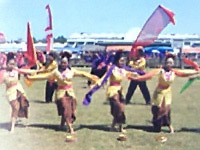 The traditional Artistry is still existing with new creation of local choreographers, who are active in dance galleries such as; Tarara dance gallery in Bangkalan district and Larasati dance gallery in Burneh district. a. Traditional ceremony of Rokat Tase' in Sepulu district and Arosbaya district, that is ceremony ritual to request safety and benediction of sea from God. b. Traditional ceremony of Jaran Kenca' in Socah district, that is expectation ceremony of guest at event of sunatan reception (circumcision) and wedding party. c. Traditional ceremony of Hong Bahhong in Geger district, that is ritual ceremony to refuse the danger or disaster / disease and other bad influence in their life. d. Traditional ceremony of Topeng Patenteng in Modung district, that is ceremony ritual to request lowering of rain when length drought reach it fierceness. e. Marriage traditional ceremony of Moang Sangkal in all (18) districts. This ritual ceremony describe about a savety wishes in order not to have sin because a marriage of a little sister who having married first, left her sister who had not married yet. f. Marriage traditional ceremony, Ka' Okke in all districts.